Aku Melayu. Walaupun aku ditindas oleh universitas yang dipenuhi dengan bangsaku sendiri, Kerana ku tidak berbahas dalam bahasa yang disenangi, Aku masih diingati, Yang aku ini, Melayu. Walaupun ibuku dihina, Kerana berbangsa Cina, Dan dituduh haram kerana pernah makan babi, Aku masih diingati, Yang aku ini, Melayu. Aku ditegur tidak menutup aurat, Dan dikatakan tidak sopan sangat, Kerana cara percakapan ku kasar, Dan kelakuan tidak ayu, Aku tetap diingati, Yang aku ini, Melayu. My sense of proximity, shattered. Just like a drop of water, longing to merge once more with the ocean.. Relationships are difficult to start, maintain and end. Some times it is better that people have what they have and move on their separate paths after that. This piece is inspired by 'Wake Up Sally' from 'The Surrogate Friend' album by the one and only Francis Wolf. I got you smiling just right. This isn't your bed anymore. Don't ask me again tomorrow. You very well know what I will say. Along with the side of me I will never show. I was given the phrase "footsteps at the door" as my #SemiGodsUnited assignment. That phrase reminded me of back when I was a kid and my parents would always come to check on me to see if I was asleep. I would be reading a book under the covers with my brother's torchlight and when I heard their footsteps, I would quickly turn off the light and hide the book under my pillow. Sometimes I got caught but they'd just give me five more minutes. And she couldn't help but smile. Her pudgy feet gave her away again. A tiny voice said "come in"
What greeted her was a big goofy grin. So she gave her five more minutes. I was taking my ablution for the terawih prayers when I first had the idea for this poem. The idea that all Muslims from all these different walks of life, committing sins big & small every day, coming to one place to ask for forgiveness & to pray to the Almighty for better things, truly captured me in that moment. It isn't being done justice in this poem, but it is an experiment for me in consolidating spirituality & poetry. Face. The remnants of the alluring make up, Put onto entice and tease, Eyelashes to bat at wandering eyes, And red lipstick to amplify a "come hither" smile. Mouth. Gargling out the words of hate, The off-hand racist remarks, And the gossip that is questionable at best, As well as the mutterings under her breath. Ears. Washing away the untruths, That were indulged over lunch, And the eavesdropping of conversations, Out of blatant curiosity. Sometimes the sun makes us gay. Camelia Come sniff what I saved. A dried camellia I picked from Izumo’s hills. Riceball Lesson We made sankaku -triangle onigiri. Oh! - labor for food! Cherry Petals Cherry petals swirl when the wind from the north blow. Some fell on my hair. fell down swiftly on the ground. Us On the gathered snow, How good to flow together. Like we are water. If you and I had a chance to live out our wanderlust, it would probably be like this. But first I would have to find you. Ruffle the fringe across my face. Take our senses on a journey. Taste sunrise on our pasty skin. As daylight regresses to dusk. Bask gloriously in the rays of sunset. Fall asleep dreaming of dreams. Someone posted a picture of a rainbow on Facebook and as I was looking at it, I started to think about the colours and how I would associate them with you. When you told me that it was me you wanted to marry. It gave me a warm feeling inside. The way you light up when you talk about it is beautiful. It's one of the things I love most about you. I didn't mind getting bitten by mosquitoes. Despite knowing me Just skin deep. Inspired by a story heard at an iftar gathering during Ramadhan, about two students getting caught making out behind a vending machine. Young love sometimes blooms in odd places. Many a times, Love and Lies go hand in hand in a partnership. A lyric inspired piece based on 'Love and Lies' from The Surrogate Friend album by Francis Wolf. In the same bed we lie. With lies in your eyes. Turn your back to stay. I am not a poet, I do not write about politics, And how it makes me sick. I do not write about global warming, And how its effects are getting pretty alarming. I am not a poet, I do not write about feminism, And how hard women have to fight against chauvinism. I am not a poet, I do not write poems that will blow your mind, And ones that are perfectly rhymed. I am not a poet, I write about what I know but there is very little that I know, And so my verses are not diverse. I am not a poet, I write about heartbreak and love, Or at least what I know of it. I was thinking about the convergence of TV show characters, and how the plot would be different if two characters were to have gotten together to create a super-couple (or in this case, non-couple). This is to Ross from Friends, and Robin from How I Met Your Mother. You are the Ross to my Robin. This unconventional pairing, Of TV characters from different shows, That in a perfect fandom, Would fit together in all its imperfections. You are the quirky intelligence, With odd little habits, Like a serious attention to detail, And an intensity when you look into my eyes. I am the closed off romantic, That allows small doses of glee, To escape me when you make me smile, But remembers that all this is just a feelingless facade. This arrangement works on so many levels, Because Ross doesn't need a dainty girl, Or a brainless blonde tart, But someone a little bit more challenging from a different TV network. I read this thought catalog post about how in order to let go of something, you need to list down what you want to let go. I decided to incorporate that and the 5 stages of grieving to write this piece. Five, I want to stop waiting. I need to stop telling myself that one day you would come back. I want to stop thinking that all this is just a bad dream and all I have to do is wake up, and things would be back to the way they were. I want to not associate 'home' with you. I don't want to think of you as my safe place anymore. I want to not associate anything with you. Four, I want to be able to say that we gave it a try and it didn't work out. I want to get rid of this nagging feeling at the back of my head that says you didn't even try. I want to not blame you. I want to not resent you. I want to let go of my anger towards you. I need to come to terms with the fact that we are not meant to be, and that’s ok.
You can read At The Ledge by SB here. On the edge of the ledge. You can choose to back away, but where will that lead you? You don't have to fall, little girl. You can just slowly come down. You will be welcomed by your love for yourself. Because you made it down there with love in your heart. Rejoice if someone is there to meet you. Take the love he offers you. Poetry inspired by a full moon atop a rooftop bar. "Today, I challenge you to write a poem in which you closely describe an object or place, and then end with a much more abstract line that doesn’t seemingly have anything to do with that object or place, but which, of course, really does. I think of the “surprise” ending to this James Wright Poem as a model for the effect I’m hoping you’ll achieve. An abstract, philosophical kind of statement closing out a poem that is otherwise intensely focused on physical, sensory details." Let's start at the 4-way traffic light. Go straight down Jalan Bahagia. And the hidden road to the backlane of the LRT station. Go further down and to your left. The land of small Giant, Syed Bistro, Kedai Sebelah & Energy Fitness. Go straight all the way & you'll hit Paradigm Mall. Theme songs made for every endeavor. Night lights give us comfort to sleep just as how we go driving through the city streets deep into the wee hours of the morn. 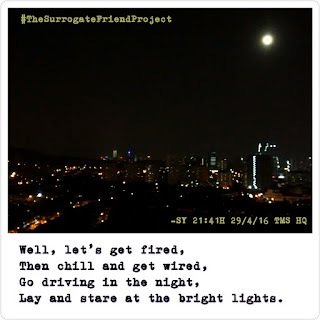 This poem is inspired by 'Driving In The Night' from 'The Surrogate Friend' album by Francis Wolf. Well, let's get hyped and fired, Then chill and get wired, Cruising through the city streets, Jamming with the hip hop beats. Tar roads and gravel, All the same as we travel, Arrows and painted lines, Traffic lights and bill board signs. Past the graffiti and kelundings, Savour all the subtle things, Let go driving in the night, Set on park beneath the bright lights.